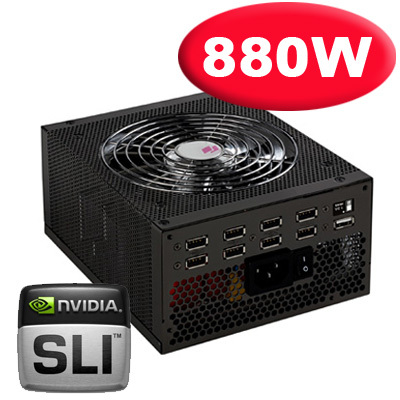 Hiper Type R II 880W ATX Power Supply, 3way Technology, Ltd. The HiperPowerDesign Series is dedicated to environmental minded design loving power enthusiasts. These PSUs perform with Efficiency of 85% plus (!) and are available in 680 Watts. Even more there are two colors to choose from. Patented Feature: total of 8 integrated USB 2.0 ports, one convenient USB-style port for charging most mobile devices even when the computer is powered off. The Type R Series comes in the unique HiperToolBox, with a high quality finish and many accessories. USB 2.0 chipset by NEC. Bullet Four independent 12V rails. Bullet Support NVIDIA SLI & Quad SLI. Bullet Mesh body Patented construction allows immediate heat dissipation and extends the life of the unit. Bullet Complies with latest ATX12V v2.2 / EPS12V v2.91 form factors. Bullet Fully compatible with AMD 64 bit and Intel LGA processors. Bullet Gold plated connectors for minimum power loss and optimal conductivity. Bullet PCI-E (6-pin), PCI-E (8-pin), SATA, Molex with EZ-Grip, floppy, P8 & P4 connectors. Bullet 20 dB(A) under normal load.